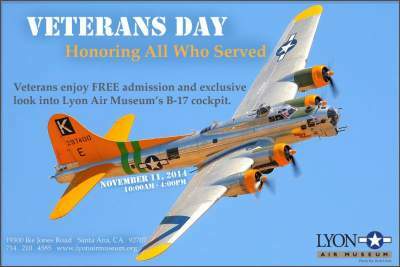 The Lyon Air Museum is offering free admission for veterans with the opportunity to get a first hand look inside our Boeing B-17 Flying Fortress. They are located at 19300 Ike Jones Road, in Santa Ana. 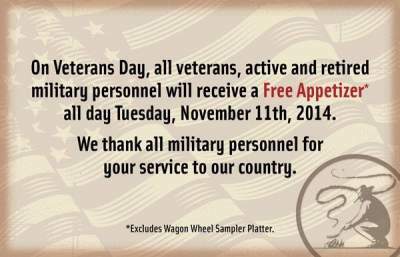 McCormick and Schmick’s is offering a complimentary meal to veterans on Sunday, November 9, 2014. Click here for more info. Locally they have a location in Anaheim, at the Garden Walk at 321 West Katella Ave. The location in Irvine is being repaired after a major fire a few weeks ago. Reservations are suggested. The National Parks and Monuments are offering free admission on Veterans Day. Fee waiver includes: entrance fees, commercial tour fees, and transportation entrance fees. Other fees such as reservation, camping, tours, concession and fees collected by third parties are not included unless stated otherwise. Outback Steakhouse is offering free Blooming Onions and a Coca Cola beverage to veterans on Veterans Day. They are also offering a 15% discount on meals to active and retired members of the U.S. Military for the rest of the year, starting on Nov. 12. There are local Outback Steahouses in Buena Park, Costa Mesa, Garden Grove, Irvine and Westminster. Click here for location info. The Richard Nixon Library is offering Free Admission all day on Veterans Day. This deal is for everyone, not just Veterans. 10 AM: East Room program featuring keynote remarks by former National Security Advisor Robert “Bud” McFarlane, remarks by decorated Vietnam War prisoner of war Lt. Col. Orson Swindle, a formal Presentation of the Colors, performances by the Villa Park High School Jazz Ensemble and Orange High School Concert Choir. 12:30 PM: A spectacular performance of All-American classics from the renowned 90-member Placentia Symphonic Band. The Richard Nixon Library is located at 18001 Yorba Linda Blvd., in Yorba Linda. Ruby’s is offering a free breakfast entrée or a free hamburger for lunch or dinner to active or retired members of the U.S. Military on Veterans Day. Come in uniform or bring a Military I.D. Kids eat free on Ruby’s on Tuesdays too! Click here for details. They have OC locations in Anaheim, Balboa Pier, Corona del Mar, Costa Mesa, Huntington Beach, Irvine, Newport Coast, Orange, Tustin and Yorba Linda. Click here for location details.